News comes to me of a forthcoming phonetic workshop to be held in Maine (northeast USA). It is entitled “Joy of Phonetics” and will be given by Louis Colaianni. It will “explore and embody virtually all of the sounds of the English language, as well as some foreign sounds”, not to mention “exploring the expressive attributes of vowels and consonants”. Expressive attributes? You can see that it is aimed at voice-speech-and-drama people rather than at students of linguistics, laboratory phonetics, or speech and language therapy. What really grabbed my attention, though, was the promise of “learning exercises and games using phonetic pillows”. Phonetic pillows? I don’t think I’ve ever had a phonetic pillow. Did you know you can buy a supply of them? Here’s what they look like. It turns out that they are pillows in the shape of phonetic symbols. I’m not sure how they are used: perhaps if I throw a stuffed schwa at you, you cry ə, and if you retaliate by throwing an esh at me I have to go ʃ. Here's a pillow in mid-throw. (Not quite sure whether it's a, e or ɐ.) This picture comes from a page headed Phonetic Pillow Teacher Certification. Somehow I fear I would not have been taken seriously if I had tried phonetic pillows with the students of linguistics and of speech therapy that I used to teach. But the drama students with whom I moonlighted when very young would have loved them. EFL teachers, do you think your students would benefit from this method? On another point, are they colour-coded? Not sure how that would work, but you'd think that someone with the imagination to turn IPA symbols into pillows could come up with some inspired way of doing it! I was heartened to see that for the study of foreign languages and accents I only need to familiarise myself with [ʏøœyɲβçɣχʁʎɥ] (and three tildes). If only someone had told Ladefoged and Maddieson, they could have saved themselves an awful lot of time. On the other hand, it's easy to be critical, and these probably do make phonetics classes more fun (and "kinaesthetic") for those who are not committed linguists/phoneticians. P.S. if Professor Wells is right in his suggestions for use, what do you do when someone throws you a tilde? >>P.S. if Professor Wells is right in his suggestions for use, what do you do when someone throws you a tilde? Catch it and balance it on your nose? I suppose we have to just accept the fact that 'phonetics' means lots of different things to different people. But it is a bit annoying when people describe themselves as experts in 'phonetics' when they mean they are elocutionists or proponents of phonics for teaching reading. Or even EFL teachers who have bothered to learn a set of phonemic symbols. Which raises the question - at what point does a phonetics enthusiast become a phonetician? 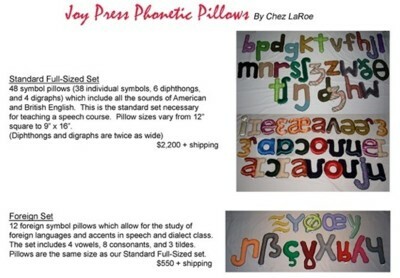 When I first saw 'phonetic pillows', I imagined pillow cases with the IPA chart on them. Now that'd be something! with respellings like (al - fah) (brah - voh) (char - lee) (dell - tah) to add insult to injury. What could be more annoying than the fact that untold millions think THAT is the International Phonetic Alphabet? If people use uptalk, we could throw falling tones at them. Phonemes may contribute to meaning, but they are not the sort of meaningful items that EFL teachers are concerned with. So we'd be happy to have students catch car pillows and say 'car', right? Well, I don't think so. A car pillow is a symbol of an object. The pillow game would help associate the spoken-word symbol with a a different symbol. No different in principle from learning from the symbol that is a written word, or from the symbol that is a translation of the word in the student's native language. What we want is to associate the symbol that is an English word with an object. Of course, this isn't the end of the process. The student must be able to associate an object such as a model car with the semantic concept CAR. Fortunately, this is not a pedagogic problem. Provided that the association is with more than one object, the student will infer the type from the tokens without any assistance from the teacher. This empiricism set British teaching apart from the rationalist French, who at one time went overboard for 'audio-visuel' methodology. It's only just occurred to me, but the French was an essentially rational process, starting always from the pictorial symbol. In Britain, we started from the physical experience — at least in the earliest stages. It was known as 'the direct method' — although that term was originally coined to mean something rather different. In America it was sometimes known as 'total physical response'. That business of presenting students with a plurality of tokens. I'd forgotten my wife's story of her very first lesson teaching English to a school class in Soviet Russia. She had been taught the principle — but not the practice — of 'direct method' teaching, and tried to do as she'd been told. So, dressed in her smartest cardigan [Keep that cardigan in mind], she pointed dramatically to herself and said I. Most of the kids gawped in perplexity, but one smart student responded, 'Button'. Or even EFL teachers who have bothered to learn a set of phonemic symbols. If EFL teachers want to go further in teaching pronunciation, they need some descriptive phonetic information. Back in the old days, I twice did phonetics courses in studying for TEFL qualifications. But this is now becoming rare. All over the world, students have much more experience of listening to native English speakers as consumers of media rather than as students. Even the non-native speakers in local media are much more likely to speak with an accent that can be understood anywhere in the world. And far more students have an opportunity to interact with native speakers and/or very good speakers. In short, students are much more likely to acquire decent pronunciation without specific lessons from the teacher. Neither teachers nor students start from a need for recognising phonetic symbols. Pillows won't help. Symbols can become useful after the phonemic distinction has been grasped. For the teacher, it's enough to see the orthographic representations of minimal pairs. For the student it's often better to see pictorial representations of the pairs. The popular pronunciation coursebook Ship or Sheep? has a picture of a ship and one of a sheep on its cover. To bombard students with ship cushions and sheep cushions would add nothing to the learning experience. Could anyone comment on how much use the "voice-speech-and-drama" people make use of IPA? My subjective impression is that it's used far more for this purpose in the US than in Britain, but that could just be an accident of my own personal experience. As an accent coach who works primarily in the British Drama school setting, the five internationally recognised institutions I have worked in all had at least basic phonetics as a required part of the course. The rationale for teaching it is primarily to facilitate the teaching of accents. There is not really the time allowed to the subject to teach it in any huge depth - though I do have the Phonetics Blog listed on my handout of 'useful sites'. I too have received an invite to Maine - finances will not allow me to go, unfortunately. I don't know of anyone in the UK who uses the pillows as a teaching tool - possibly because we tend to work peripatetically in several schools, and I'm not sure the Pillows would be terribly easy to transport on the piccadilly line in the morning rush hour. I understand that there is a tradition in the US of the IPA being associated with elocution and American linguists shunning it for that reason (at least in the past). "voice-speech-and-drama people" in both North America and the UK make extensive use of phonetics. Sophisticated accent and dialect coaches in both places (the kind who read this blog, have Professor Wells' books on their shelves alongside Ladefoged's, Labov's, etc.) use extremely narrow descriptive phonetics ("Christmas tree transcription" on occasion, festooned with diacritics) both to record and analyze observations and to communicate them to actors who are equipped to read them. How many trained actors are fully proficient in the IPA? Not many, but some. And many more have a basic proficiency of a sort that still comes in handy when learning accents or receiving other speech notes. Over the last 10 or 15 years, an increasing number of US actor-training programs have begun to teach descriptive phonetics in some depth. (A very small minority of these programs, to the best of my knowledge, use phonetic pillows.) 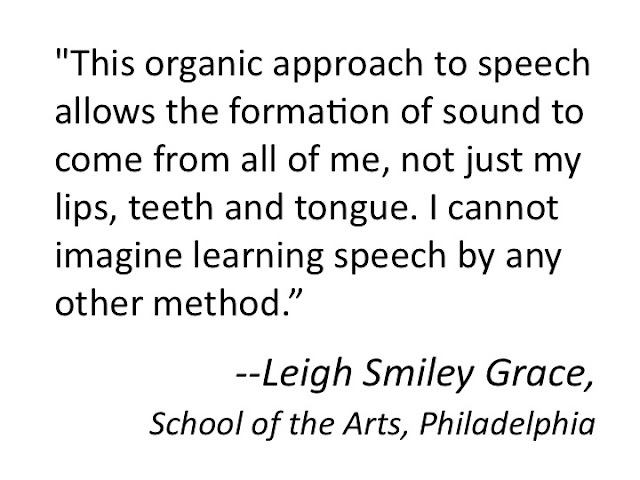 I taught speech for 2 years in a well-regarded MFA program, and the large majority of my students were well-versed in practical, descriptive phonetics by the time I was done with them. There is a significant history in the US of an older mode of "phonetic" instruction. This is the "World English" of William Tilly, popularized and propagated in the early-mid 20th c. by teachers such as Margaret Prendergast McLean and, in the theatre, Edith Warman Skinner. Skinner's Speak With Distinction and its "Good American Speech," is, regrettably, still taught in many American drama schools. I say regrettably because (1) the book is prescriptive in a profoundly influential, but deeply destructive way, (2) the set of phonetic symbols taught are confined to "official" English phonemes, and (2) the version of the IPA that it teaches is the long-abandoned unconnected script characters that Tilly and his followers insisted on, but that have long since been abandoned by everybody else. More importantly, of course, the prescriptive cast of the entire text makes the phonetic symbols confusing and less-than-ideal for the study of accents, which actors need to be able to do. The upshot of all of this is that in any given theatre production, the accent coach may have actors who have some familiarity with the IPA, some who are familiar with the Skinner version and will have to be specially-catered to, and some with no phonetic knowledge at all. The situation is improving, however. The Skinner disciples, though still holding firm to some bastions of American actor-training, are fading.